During the Spring and Summer a lot of time is spent outside just enjoying the environment. It’s always nice to enhance the surroundings, though, with a little extra decorating. These outdoor mason jar ideas will add that little extra something special. 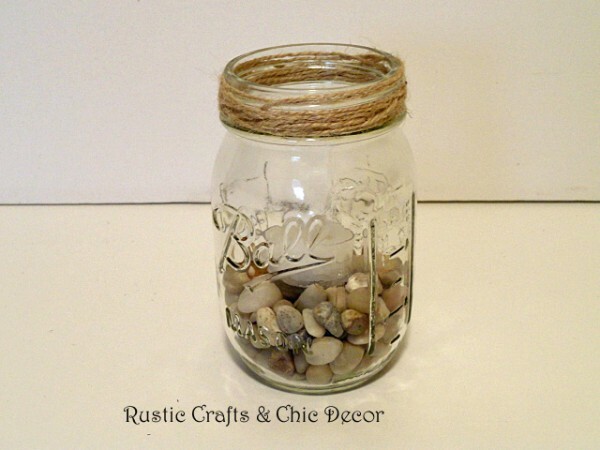 Mason jar crafts have been hugely popular for gift ideas and indoor decorating but there are also several craft ideas for using mason jars outside. My favorite use is to make citronella tea light holders to set around our deck to help keep away the mosquitos. I just fill a mason jar about a quarter of the way with small pebbles or beach sand and then drop in a citronella tea light candle. To add a little something to the top, I just wrap some twine around the neck. These are real quick to make and look nice sitting around an outdoor sitting area while they do their work of warding off those pesty mosquitos! If you don’t want to use citronella, you could also just drop in a regular tea light candle. This would still give some romantic lighting at your outdoor table in the evening. Martha Stewart has a great idea for using mason jars as a shield to protect those seed packets to make excellent plant markers. 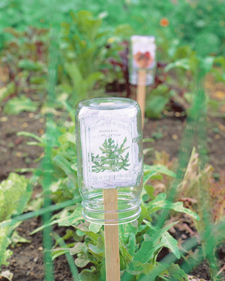 Since the seed packet has all the information that you need about the plant, it makes the perfect plant marker and the mason jar offers great protection from the elements. 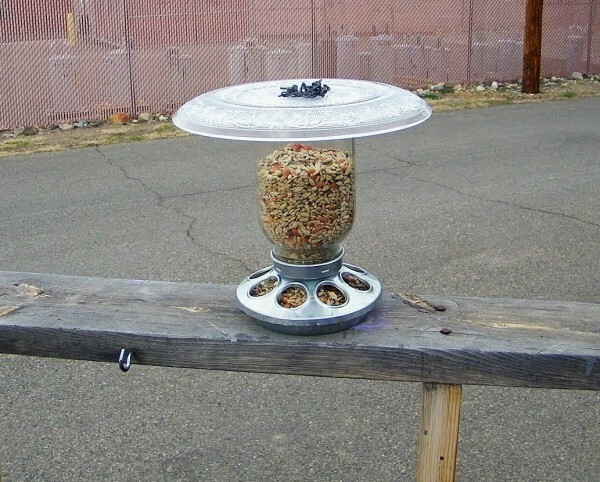 I have seen these mason jar bird feeders around quite a bit and think they are so cute. The main thing required, besides a mason jar, is a chick feeder. A farm and fleet type of store will have these. Check out the easy to follow tutorial by CeLynn’s Sunflower Patch. If you want some outdoor lighting but don’t want to burn candles, this idea is for you. 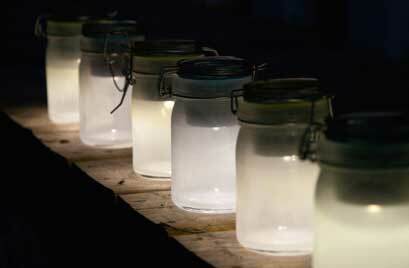 These DIY mason jar solar lamps are the perfect solution for flame free lighting. Here is a great idea for some outdoor patio lighting to hang from a covered porch or gazebo. Mason jars were just attached to an old ladder using wire handles. You could fill the jars with either candles or solar lights. I also love the addition of the rusty star! There are also some fun ideas for using mason jars in outdoor entertaining. They make great beverage glasses or utensil holders and you have an easy outdoor centerpiece when you fill one with fresh flowers. 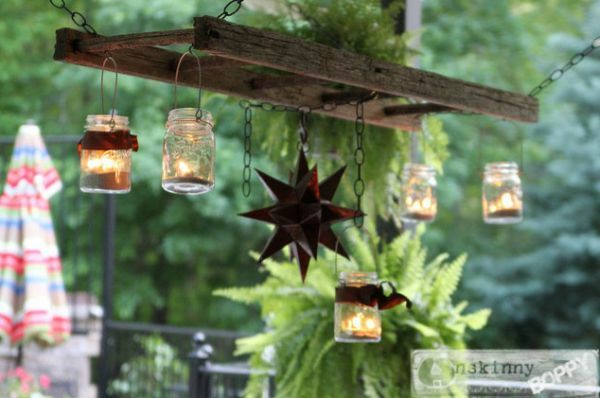 What ideas do you have for using mason jars for outdoor decorating?